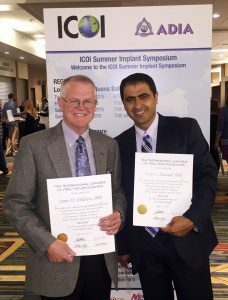 Dr. Childress and Dr. Alassaad are very excited to receive their Fellowship Award of the International Congress of Oral Implantologists (FICOI) in San Francisco in August 2015. This award recognizes the Drs’ fulfillment of the educational and expertise requirements in surgical implant placement and restorations as well as their commitment to constantly remain updated with the latest advancements in implant dentistry. Hip Hip Hooray to Dr. Childress and Dr. Alassaad!